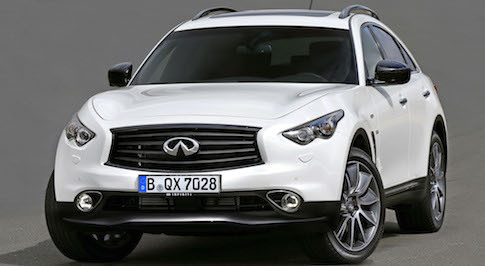 Infiniti is to premiere it's new QX70 Ultimate tomorrow at the Frankfurt Motor Show. Featuring subtle front and rear design changes, which include new dark chrome trim at both ends and a new front splitter and rear diffuser with an integrated fog light, Infiniti claim the luxury crossover SUV will be more expressive and exclusive than ever before. New 21-inch anthracite alloy wheels and daytime running lights mean the car will be visible yet stylish on the road. The car can be powered by either a 3.7-litre V6 petrol engine or a 3.0-litre V6 diesel unit, both of which come with a 7-speed adaptive shift automatic transmission with gearshift paddles mounted on the steering wheel. The Ultimate's spacious and luxurious cabin boasts shiny black lacquer surfaces and soft leather upholstery with purple stitching. Fran�ois Goupil de Bouill�, the Vice President of Infiniti Europe, Middle East and Africa commented: "The QX70 has long struck a chord with buyers seeking something exceptional but the Infiniti QX70 Ultimate is designed to respond to the most exclusive needs and desires of buyers."